Disaster Happens, it’s a given whether man-made or natural, we can pretty much know that at some given time or another we or a loved one will have to endure and survive a disaster. Often times when discussing such things the conversation can take on some pretty dramatic terms, just like a disaster and even talking about what to do can be overwhelming to even those experienced in being prepared. The first thing to remember is you do not need to be a survival “expert” to be prepared. But you do need to be alert ,aware and have make a plan. 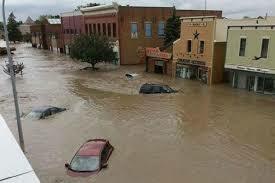 The thing is, disasters can happen anytime, maybe while you are reading this, are you ready? Don’t panic even if you are new to the game of preparedness or an old hand that just needs to tune up your plan. There are steps you can take right now to be ready. 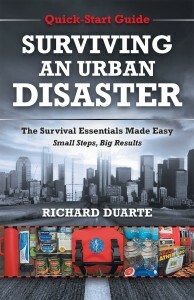 Preparedness author Richard Duarte will join me on Monday June 1st to get you started as we review his Quick Start Guide Surviving an Urban Disaster. Wait, don’t think you have to live in an Urban setting for this show to benefit you, the tips and information will work for you no matter where you live or find yourself at the time a disaster hits. Join us for a live conversation as we talk about how small steps have big results. Listen to this broadcast on Surviving an Urban Disaster!in player below! Previous: Previous post: Severe Burn Care When There’s No Doctor! Next: Next post: Homesteading & Self Sufficiency!